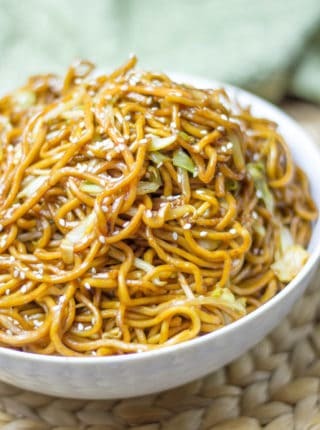 This soup is the perfect addition to our popular list of take-out Chinese food recipes, and you can serve it along with Lo Mein, Chow Mein, and Orange Chicken! Hot and Sour Soup is one of my all-time favorite Chinese food recipes, made with pork and tofu in a savory broth that’s a little bit hot, a little bit sour, and full of flavor. This is a lot like egg drop soup, but with heartier ingredients like meat and vegetables instead of mostly egg. 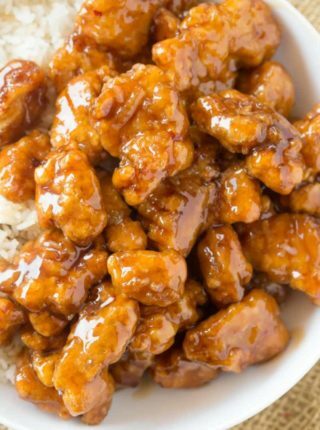 Serve this with one of my other popular take-out recipes, like Hunan Chicken, or Mongolian Beef. This recipe takes a total time of a little over an hour to cook, so be ready. I also recommend having your veggies prepped and cut up before starting the recipe. CAN I FREEZE HOT AND SOUR SOUP? 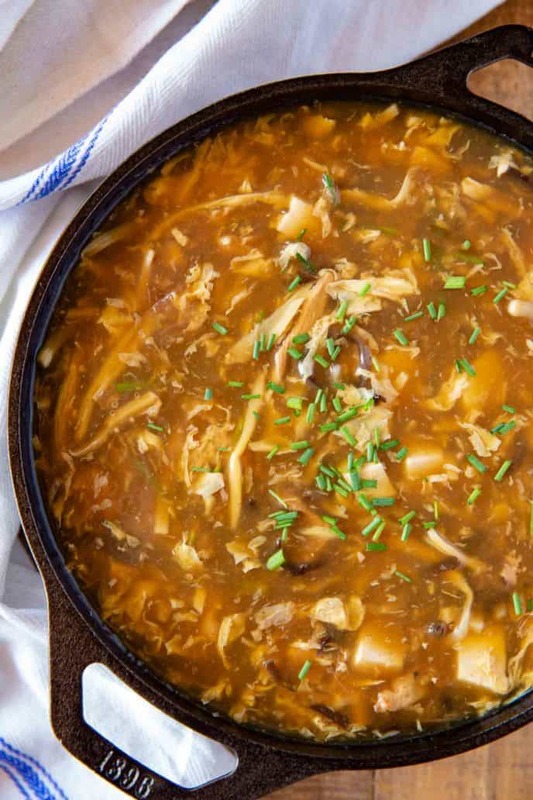 You can either store your hot and sour soup in the refrigerator for 2-3 days, or in the freezer for several weeks. Reheat hot and sour soup in a large saucepan over medium heat until warmed through. 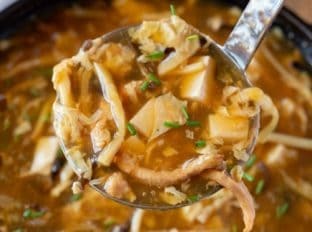 Hot and sour soup is usually made with pork and tofu, but you can use chicken, shrimp, or beef if that’s what you have. Or leave the meat out entirely and just use tofu for a vegetarian hot and sour soup. Make sure you buy firm or extra firm tofu, or the tofu cubes may fall apart in the broth. You can substitute the woodear mushrooms for shiitake mushrooms. 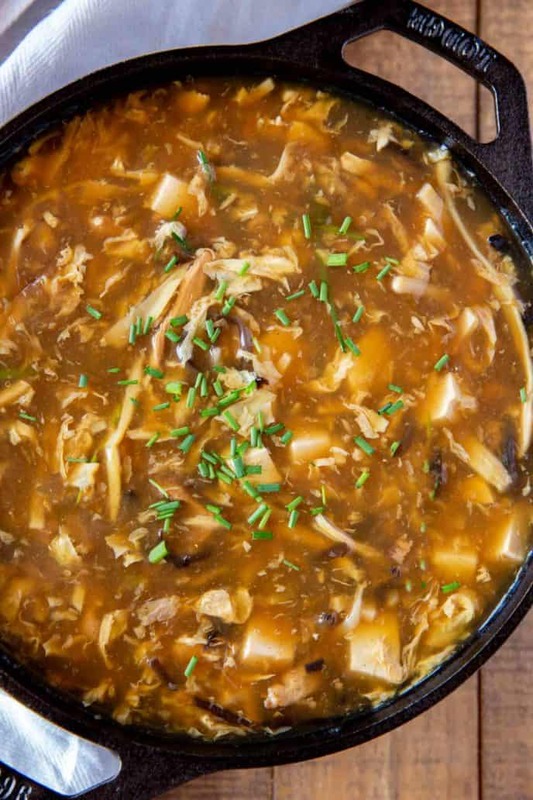 A lot of sweet and sour soup recipes will call for shiitake mushrooms because they add a deeper flavor to the broth, but you can add even more complexity by using a combination of both. Add extra spices, like white pepper or cayenne pepper to make this hot and sour soup even hotter. 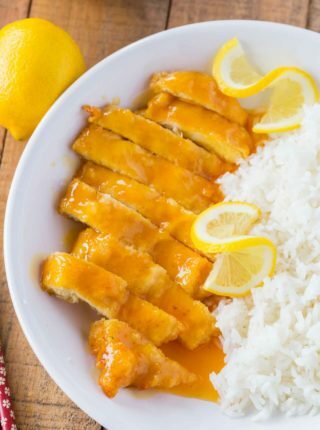 I like to use low sodium soy sauce to lighten up this recipe a little bit. 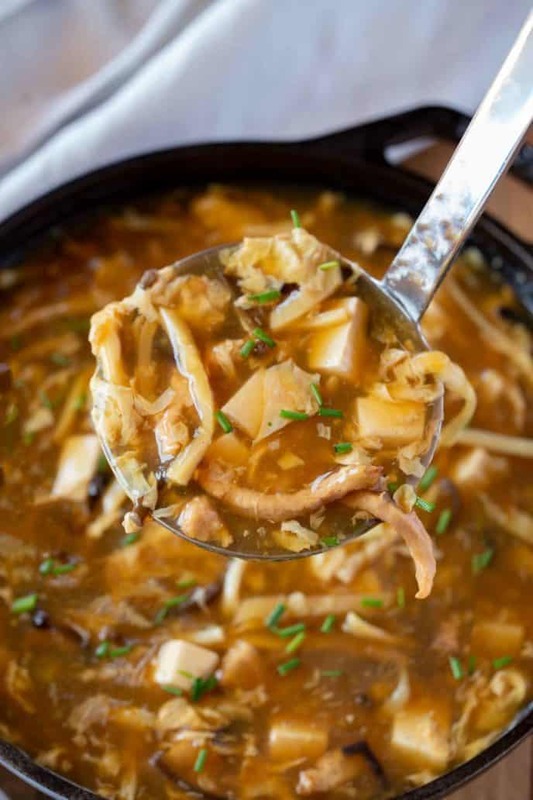 This hot and sour soup recipe traditionally uses mushrooms, bamboo, and onions, but you can add other veggies that you have on hand like carrots, green onions, bok choy, cabbage, or leftover stir-fried veggies like broccoli. This sweet and sour soup recipe uses chicken stock, but you can use vegetable stock if that’s what you have, or if you’re making this vegetarian. Add a few dashes of sesame oil for flavor. You can add the sesame oil to each bowl when serving, or to the whole pot. Using sparingly, because it’s really strong. Be careful when adding your eggs, if you drop them in too quickly you won’t get the ribbon-like strings that are a signature for this dish. 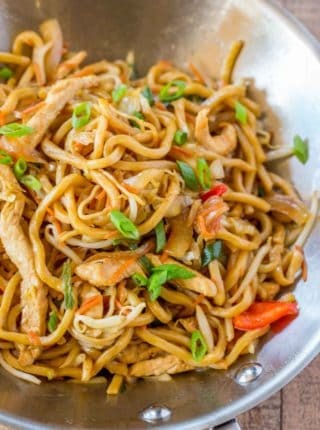 It’s not traditional but you can add lo mein noodles or rice noodles to this dish if you want to or have them leftover from another dish. Ingredients call for 8 cloves of garlic, but the directions never call for them to be added to the soup. At what point do you add the garlic? You’ll want to add them into step 2. Enjoy! I don’t see instructions for adding the garlic. When is the garlic added?? You’ll want to add them in step 2 with the green onions, onion and peppercorns. Enjoy! This is one of our favorite soups! Makes takeout at home so much easier. Easy soup recipe, it’s one of our new favorites! This is my favorite soup when we visit Chinese restaurants. I never knew it was so easy to make at home! You are my new BFF! Love the soups they give at Chinese restaurants! This one is delicious, filling, & the perfect combination! So perfect for when you don’t want to go out.